The Labour Court yesterday (Wednesday 2nd August 2017) adjourned the Dunnes Stores workers’ Labour Court case for six months pending the introduction of new primary legislation which has the potential to address the workers’ claims. The Court was informed that two specific pieces of legislation are progressing through the Houses of the Oireachtas which would give Dunnes Stores workers, and all other workers in Ireland, the right to secure hour contracts. Mandate can re-enter the case at any time over the coming months should the legislation not materialise or if it doesn’t address the serious concerns of Dunnes workers. The first of these pieces of legislation is the Banded Hour Contracts Bill 2016, which was sponsored by Sinn Fein TD David Cullinane. This Bill, if passed, would enable workers to have a contract that reflects the hours they actually work. The government are also planning to introduce legislation in September which would address the key issues contained in the Mandate v Dunnes Stores Labour Court case. Mr Light explained that the Union and its members would commence a campaign for the swift passing of legislation by all members of the Oireachtas. The Banded Hours Contracts Bill has now progressed through the Joint Oireachtas Committee but is waiting for amendments to be ratified. Mr Light said, “If there was an appetite from Fine Gael, the Independent Alliance and Fianna Fail to sort this issue out, it could be done in September. That’s why we’re going to need all of the Dunnes workers, other Mandate members and the rest of the trade union movement to lobby these politicians and put pressure on them to pass this legislation as a matter of urgency. More details on this campaign to follow. Mandate Trade Union lodged a 3 percent pay claim for all Dunnes Stores workers in April 2017. Since then, Dunnes Stores have refused to respond to the claim. Mandate has this week referred the pay claim to the Workplace Relations Committee (WRC). Since last October, Dunnes Stores have refused to process new members into the Union when they chose to pay Union dues through wages (deduction at source). This is in direct contravention of agreements and practices between Mandate and Dunnes Stores going back decades. Furthermore the company has also failed to implement last year’s subscription increase of 20 cent in Union deductions from wages. He added, “In light of this attack on your Union we have decided that all new applications for membership should be referred to our new on-line payment system. This is a very simple method of enrolment and payment for new members. “Perspective members can easily choose whether to pay their union subscriptions weekly or monthly with their debit or credit card. This system will remove the need for paper application forms as all details can be provided on-line at the enrolment stage. New members should be directed to sign up to Mandate at www.joinmandate.ie. If Dunnes Stores workers are to ensure that we achieve secure hour contracts and a decent living wage over the coming years, it is imperative that we continue to organise and get as many Dunnes Stores workers into our union as possible. This will enable us to lobby more effectively and prepare to take action when necessary. The Decency for Dunnes Workers campaign has launched a new survey for all workers across Dunnes in the Republic of Ireland. Since the campaign was launched in April this year, the campaign has had a number of successes in relation to pay and contracts of employment. In order to stay up to date with these developments the campaign is launching this very brief survey. We would like to establish the conditions of employment for all different categories of workers in Dunnes but we can only do so with your help. Please take two minutes to fill in the survey. All results will be kept confidential. Victory number two for Dunnes Stores workers! The Decency for Dunnes Workers Campaign has achieved a second significant win with permanent contracts being offered to temporary staff across Dunnes Stores. This follows the concession of a 3 percent pay increase in June for all workers at the Irish retail giant – a key demand made by the campaign. One of the four key issues in the campaign is stopping the widespread and unnecessary use of temporary and fixed-term contracts where workers initially get 2 or 3 month contracts followed by 6 month contracts. Many workers on these contracts are typically let go without explanation and are replaced by others on similar short-term contracts. Consequently, available hours are deliberately directed away from established members of staff. Mr Light feels that Dunnes management are fearful of the growing momentum behind the Decency for Dunnes Workers Campaign. “Clearly Dunnes management are attempting to take the momentum out of our campaign by addressing some of our key demands. In doing this they obviously hope that non-members will see no point in joining our Union. “Whilst this particular development is to be welcomed, it falls far short of addressing the priority issues of security of weekly hours and earnings for those on flexi-hour contracts (through banded hour arrangements) and the right of representation,” said Mr Light. Mr Light concluded by saying this outcome is a significant win for all temporary and fixed term workers across the country. “Dunnes Stores is one of the largest private sector employers in Ireland. As such, they have an enormous effect on employment standards in the retail sector and other sectors of the economy. 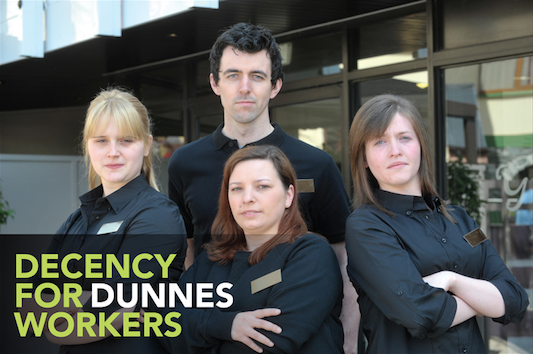 Dunnes Stores employs more than 10,000 workers in the Republic of Ireland in 116 stores. The right to representation for Mandate members in Dunnes Stores. 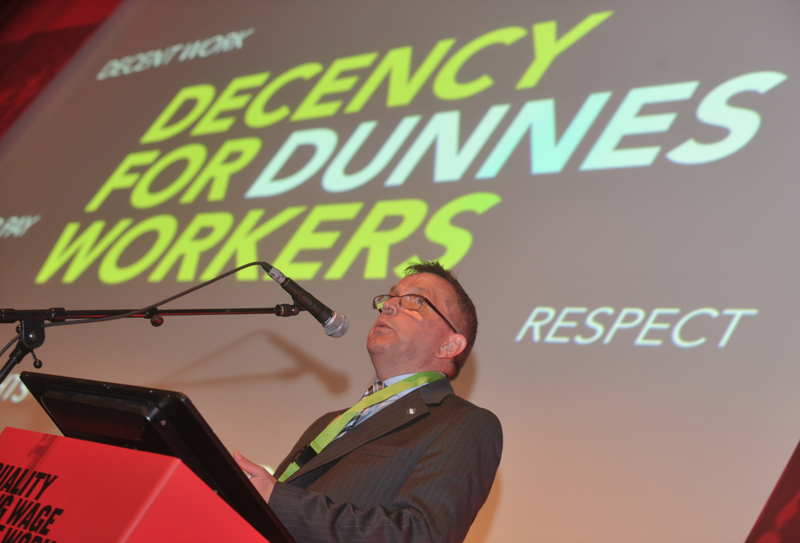 You can follow the Decency for Dunnes Workers Campaign Facebook Page by clicking here. Senior management in Dunnes Stores are continuing to avoid a meeting with their workers’ union to discuss issues of concern for their workforce – say MANDATE Trade Union. Representation rights for our members. After Dunnes failed to respond to the union within the agreed timeframe (21 days), MANDATE were forced to write to the company Directors later that month. Following this, Dunnes wrote to the union giving no indication that they would meet stating “your letter is vague and lacking in detail”. MANDATE’s Assistant General Secretary Gerry Light said Dunnes’ response is typical and their usual tactic to avoid a meeting to hear the genuine grievances of our members in Dunnes. He warned the company that this type of tactic will not weaken the determination of our members, rather it will strengthen their collective resolve. “I’m sure everyone would agree that sufficient information exists to allow a good faith meeting take place between Dunnes and their worker’s representatives. On more than one occasion we’ve spelled out very simply, clearly and in plain English what our member’s issues of concern are,” said Mr Light. Then in early July, MANDATE wrote to the Labour Relations Commission (LRC) – as per the Dunnes/MANDATE 1996 Collective Agreement – seeking a hearing to discuss the issues. Dunnes has now written back to the LRC – again, using the same stalling tactics – and accused MANDATE of attempting “to generate a dispute…where there is no actual or bona fide dispute in place”. MANDATE refute this allegation: “Our 4,000 members have genuine grievances that they wish to raise with their employer, yet the company won’t even sit down to listen to them. “MANDATE is a very responsible trade union and enjoys a very good working relationship with all of Dunnes’ main competitors in the retail sector, including Marks & Spencer, Penneys, SuperValu and Tesco. If those companies can meet regularly with their workers’ union, why can’t Dunnes?” said Mr Light. MANDATE, in consultation with their members in Dunnes, will determine the next steps for the Decency for Dunnes Workers Campaign. The Decency for Dunnes Workers Campaign is “growing by the day” according to Mandate’s Lead Organiser Bill Abom. The union has been hosting local meeting across the country in recent weeks which have been attended by hundreds of activists, members and non-members alike and Mr Abom says there’s clearly an appetite to achieve real and permanent change in Dunnes Stores. He explained that Dunnes workers are joining their union in record numbers as the campaign develops. “At all of our meetings across the country we’ve had more and more people joining Mandate. We’ve also seen a huge amount of members joining online. It’s clear that Dunnes workers recognise the benefits of being in a union. A right to representation and dignity at work. In July, Dunnes announced a three percent pay increase, the first success of the campaign. Mr Abom said, “While we welcomed the announcement of a three percent pay increase for all Dunnes workers, this was only one part of our campaign. “What we’re hearing from workers on the ground is that security of hours and earnings, along with job security and a right to representation, are what our members in Dunnes really want,” said Mr Abom. Mr Abom concluded by encouraging all Dunnes workers to promote the campaign website – www.dunnesworkers.com – and to get active in their campaign. Well done to all Dunnes Stores workers for achieving the first win of our Decency for Dunnes Workers campaign. Yesterday Dunnes Stores management announced a 3% pay increase, a concession that formed one part of our claim. Obviously Dunnes Stores has been paying attention to the growing momentum in our campaign and this pay increase goes some of the way towards achieving our overall objectives. We must now build on this victory! Dunnes Stores workers have won this victory by getting organised and mobilizing within their workplace. The only way in which workers achieve significant change and improve conditions of employment is by standing together within your union. While this victory is to be celebrated, we must not ease up on efforts to achieve all of our demands. Remember, we’re stronger together. Read a statement from Mandate issued today in response to Dunnes Stores management’s announcements by clicking here.